Lindbergh Lodge is a unique combination of gracious living and the enjoyment of the bush experience, reminiscent of the bygone 'Out of Africa' charm. The luxury, partly thatched lodge has 15 en-suite double rooms, some with fireplaces and private patios. Facilities include a pool, tennis court, lapa, game hides, conference facilities, private airstrip, hiking and mountain bikes. 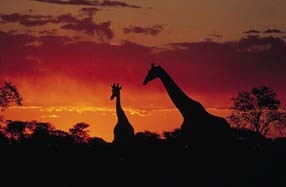 Enjoy game drives in open land Rovers as the setting sun silhouettes wildebeest, giraffe, zebra and many more.